Dubai, UAE, April 14, 2019: Just like switching our skincare routine for summer time, it’s equally important to choose the right products that are suitable for the sensitive skin of babies & toddlers and that will keep them protected during hot summer days. 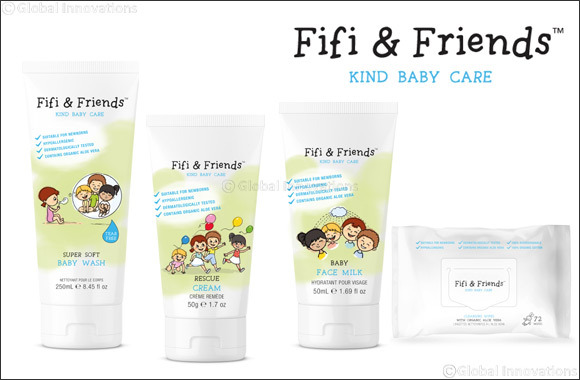 Introducing Fifi & Friends range of natural, gentle and effective bath & body products - developed specifically to care for the delicate skin of babies, toddlers and that can also be used by pregnant mothers. The products are hypoallergenic, vegetarian and free from harmful ingredients such as sulfates, parabens, wheat and silicones. This soft and mild body wash delicately cleanses even the most sensitive skin, ensuring soft and happy skin. These moisturising baby wipes freshen baby’s skin at home and on-the-go. Made with 100% biodegradable organic cotton, they gently cleanse and refresh and are suitable even for sensitive skin. It is available in 72 wipes and 32 wipes – a handy travel size for when you’re on-the-go. This sweet Almond Oil infused face moisturiser gently hydrates even the most sensitive of skins. Clinically proved to be safe on baby’s skin, it contains organic Aloe Vera which soothes and helps to protect.